Online Exclusive - Extra 25% Off Tonight 5pm To 2am CST At JCPenney! You are here: Home / Great Deals / Online Exclusive – Extra 25% Off Tonight 5pm To 2am CST At JCPenney! 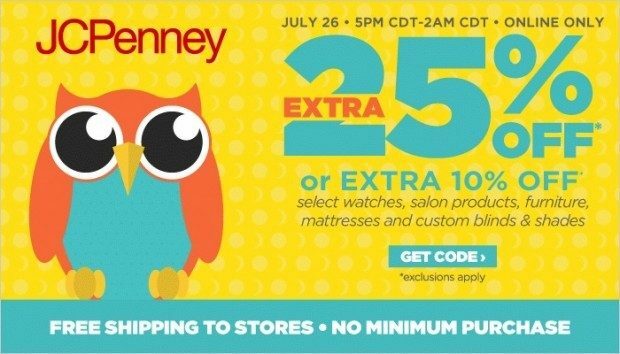 Online Exclusive – Extra 25% Off Tonight 5pm To 2am CST At JCPenney! Online only: Sunday night event! Take an extra 25% off Sunday, July 26 from 5 p.m. until 2 a.m. CST. Save on select original, regular and sale-priced items. Use online code SUNDAY26, to get your Online Exclusive – Extra 25% Off Tonight 5pm To 2am CST At JCPenney!